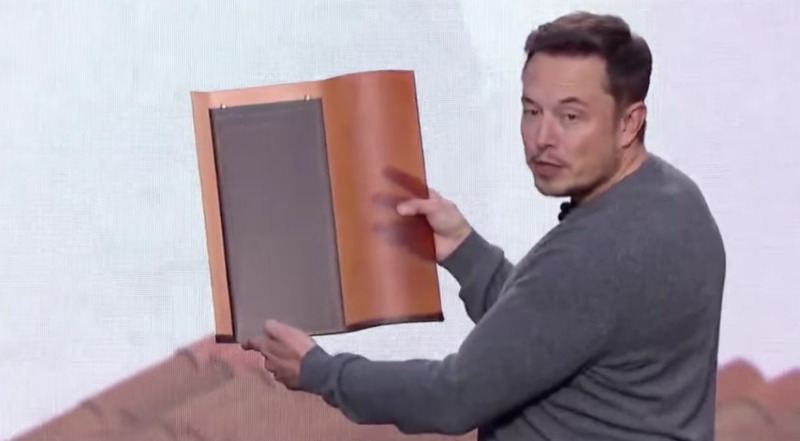 Tesla CEO Elon Musk revealed his company will begin taking orders in April for its latest product: roof shingles that are tougher than standard roof coverings and can enable an energy-independent building. In October, Tesla unveiled four different solar roof tiles that the company plans to tie tightly into its manufacturing and sales of household and commercial battery systems; the tiles can generate power, the batteries store it and then that electricity is made available for powering a home, as well as charging your electric car. The shingles will begin shipping in volume this summer, beginning with the shingle the company expects to be the most popular; that version will be followed three months later by the next type and so on. The solar roof tiles are being manufactured by SolarCity, which Tesla bought last year, and will be sold by Tesla Energy, a subsidiary of Tesla that also sells its home/business battery systems. Tesla's grand vision is to sell solar roofs that produce energy stored in its lithium-ion home and commercial battery systems and that can charge its all-electric vehicles. Musk did not disclose what, if any, price premium the tiles would have over standard rooftop solar panels sold by SolarCity, which it will continue to sell. Solar Panels will be targeted at homes with new or serviceable roofs, while the solar tiles will be targeted at new construction or replacement roofs. 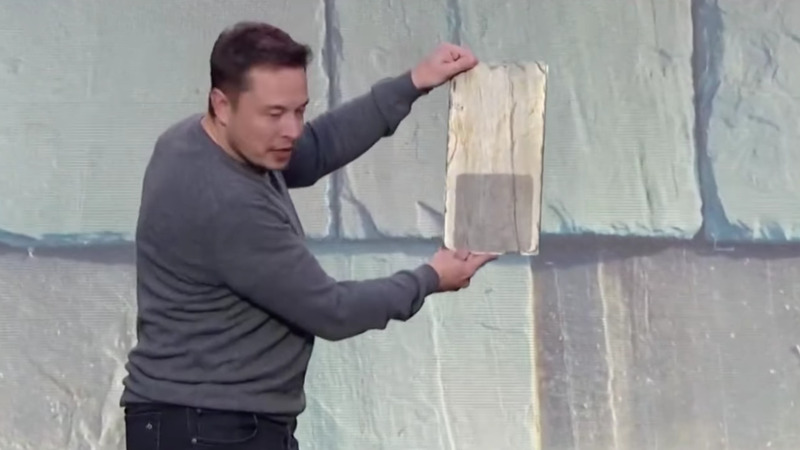 Tesla CEO Elon Musk holds up the Tuscan Glass Solar Tile, which looks opaque when viewed from the street. When viewed straight on the photovoltaic cells that generate electricity can be seen. "The cost will obviously vary according to the size of the house and the difficulty of the installation, but the important thing is the apples-to-apples comparison to a regular roof, we're confident will be at least at or slightly below the cost of a regular roof," Musk said during a November shareholders meeting. "The electricity is just a bonus." 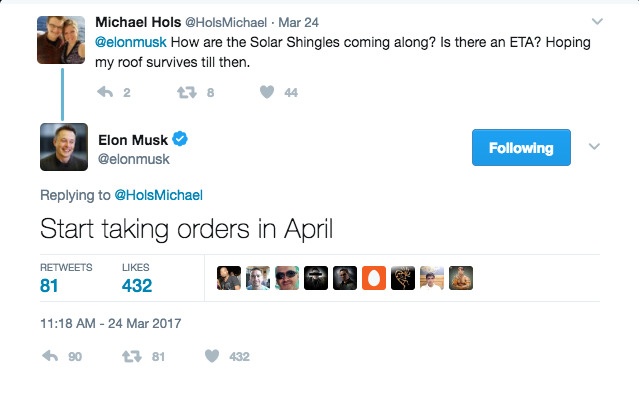 Because they're made with glass, Musk said the shingles could last "quasi-indefinitely," even in harsh northern regions, with a 50-year lifespan possible. "The goal is to have solar roofs that look better than a normal roof, generate electricity, last longer, have better insulation and actually have an installed cost that is less than a normal roof plus the cost of electricity," Musk said at the time the shingles were announced.